According to Chinese legend, the Daoist adept Wu Gang (Gōbetsu in Japanese) used the magical powers of seeds from the giant cassia trees on the moon for evil purposes. His Sisyphus-like punishment from the gods was to chop off the branches of the cassia trees on the moon, which would immediately grow back again. In this print Wu Gang wears Chinese clothes, combining an immortal’s robes with a peasant’s straw hat, and carries a huge ceremonial axe. 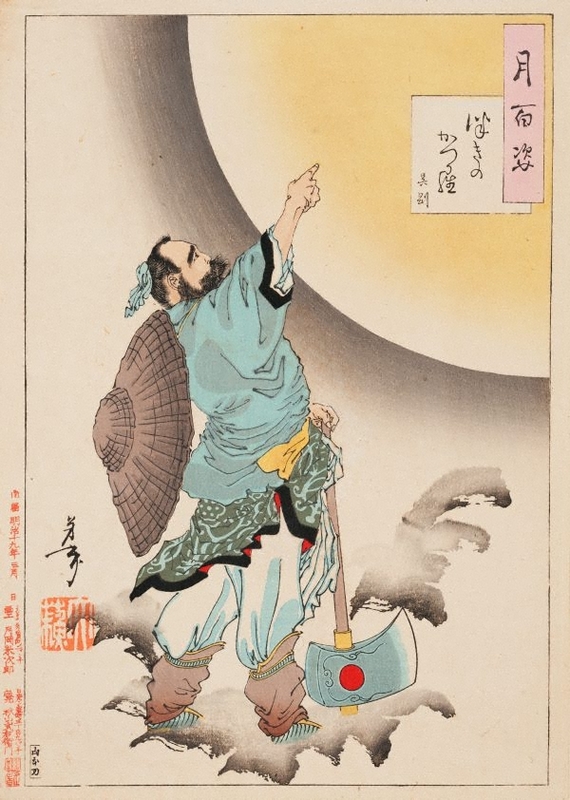 Instead of showing him suffering from the strenuous task, Yoshitoshi chose to show Wu Gang excited and proud of his new workplace, the bright moon above.